A giant leap forward for keyboard- kind, the Rise is an innovative product which oozes quality. Since we first saw the Seaboard Grand, as keyboardists we've been itching to play one. Any company that's brave enough to mess with the tried and tested keyboard format deserves a prize for bravery in my book and we're very happy to finally be able to try out the Seaboard Grand's new little brother, the Rise. 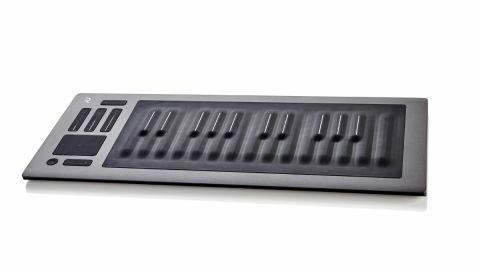 ROLI and the Seaboard range are the brainchild of Roland Lamb, who heads up a large team of developers, builders and designers in London. Already the Grand has gained many professional keyboard playing fans/users and ROLI have been moving forward, developing new instruments and ideas - there is a real excitement surrounding the brand. One of the first things that strikes you about ROLI is how slick their packaging/online presence is and a visit to their website gives plenty of insight into the brand and development of the Seaboards. There's a hint of Apple in the overall feel/vibe and, like Apple products, the Grand and the Rise have a simple understated elegance that really draws you in. The Rise comes in a black polystyrene carry case, though it really needs a handle and could do with being a lot more substantial at this price point! Regardless, the feeling of super-high-quality is undeniable once you get your hands on the Rise itself - it's built into a seriously tough metal housing with some serious weight, though it's still very portable. Down the left side are the connections, including a sustain pedal input, external power adaptor input and two USB connectors, though unfortunately there's no standard DIN MIDI connectors for connecting directly to MIDI hardware. The Rise can be powered in three ways - via USB, via the external power connector or by the onboard battery which charges via USB and which really comes into its own when using the onboard Bluetooth MIDI system. "Using the five dimensions of touch, you can shape sounds in ways not possible using a standard keyboard." Although you always need your laptop/ computer connected to use Rise/ Equator, having this wireless option at least makes it feel more like a standalone product. Setting up the Rise is a doddle too - you simply register online using the registration card, create a profile on the MY ROLI section of the website, confirm your email and download the content for Windows PC or Mac. You'll then receive an excellent software manual, the Equator software and a ROLI Dashboard application which allows set-up of the Rise from your computer's desktop. On the left of the Rise's front panel are a combined mode/power switch and the performance controls which are all backlit white. The switches/sliders are all coated in the same soft black silicone rubber as the 'keywaves' (keyboard) and are smooth yet grippy. The power switch also changes colour to denote the selected operating mode (Expression, MIDI or Bluetooth). To the left of this is an octave switch and directly above is an assignable XY touchpad (much like the touchpad on a Moog voyager) for controlling pretty much any sound-shaping parameter in Equator (or MIDI CCs for other connected DAW software/hardware MIDI instruments). Above this are three touch faders with light strips to show level, which can be assigned to any MIDI CC duties in MIDI mode, or in Expression mode the three sliders are directly connected to three of the Rise's 'dimensions' - Glide, Slide and Press. Above these is a switch for changing presets, which can work as a program change switch over MIDI. It's worth discussing these 'dimensions' as they are key to the Rise's uniqueness. First up is Strike. This is simply MIDI velocity. Next up is Press(ure). This is the pressure applied to the keyboard after the initial strike (ie aftertouch) which can send channel or poly MIDI messages so that you can affect all, or each note in a chord individually - being able to bend, modulate or filter one or more notes within a chord is a huge feature. The third dimension is Glide which is left to right finger movement for vibrato and glissando. The fourth dimension is Slide, which is the vertical movement of your fingers up/down the keys and it's great for adding filtering/tonal changes. Finally, the fifth dimension is Lift which is the lifting of your fingers off the keywave surface. You can see how the Rise has many more sound-shaping options available directly from its key surface compared to a real keyboard and the beauty is your fingers never have to leave the keys to achieve this wide range of sonic variation. Now onto the heart of the Rise, the 'keywave' keyboard. This unique and beautifully designed keyboard features 25 notes (two octaves) and it's made of the same non-toxic, high-quality silicone rubber as the buttons and as found on the Seaboard Grand. You're probably wondering how it feels and the best way we can describe it is it feels like playing a keyboard made of Haribo jelly sweets! It's soft yet resistant, smooth yet rubbery and it begs to be massaged! "It feels like playing a keyboard made of Haribo jelly sweets! It's soft yet resistant, smooth yet rubbery..."
The black keys have white stripes down their centres so you can make them out more easily, while the white keys are a little narrower than on a standard piano keyboard. While the length of the black and white keys initially appears the same (at around 6.5cm each), the black keys actually extend down all the way to the front edge of the white keys in a narrow ridge so you can slide uninterrupted from a white key to a black key. This makes a lot of practical sense and it threw us a little at first but you soon get used to it. Also note that the strips of space above and below the keys can be used for pitch slides and glissandos, which is great - they're effectively two full-length ribbon controllers. We thoroughly enjoyed using the Rise - it's addictive to play and having five dimensions of touch available simultaneously via single/multiple keys (plus all the assignable left panel control) let me achieve sound-shaping that simply can't be achieved with a standard keyboard. It works reliably/ predictably for all sound types and, while the transition from a normal keyboard does take some getting used to, the learning curve is still pleasingly shallow. The biggest thing to adapt to is the aforementioned white keys being narrower than the average finger (due to the black keys extending down so far) - you thus have to play very accurately and in a more claw-like fashion. Also note that if you approach the Rise just like a standard piano/synth keyboard you'll be missing the point, but go in with an open mind knowing you have to adapt your technique/muscle memory slightly and you'll be super-impressed! At £599 for a two-octave controller, the Rise isn't cheap but then it's unique and the software is solid and sounds fantastic. For anyone looking for a new way to control several dimensions of touch/sound simultaneously via a keyboard-style interface (media composers especially), the Rise is an inspiring and exciting option that brings to life/adds realism to any sound - even basic Logic/DAW plug-in synths became way more interesting when using real fingered vibrato and slides/glides. Importantly, it feels like the future of the keyboard has finally arrived and we're excited to see where this leads. We'd love to see longer Rise keyboards (preferably with Equator running onboard), but perhaps ROLI can also license the 'keywave' technology, as all synths would benefit hugely from it.